If you are looking for short sections of Clear PVC Plastic Pipe by the foot, we can help. We stock 1/2" thru 12" Sch 40 Clear PVC pipe by the foot and we now carry some Acrylic Clear Pipe/Tubing as well. The difference is the PVC pipe has a blue tint to it, and not perfectly clear like glass. The Acrylic pipe is clear as glass. Some of the Acrylic pipe will also fit and glue to PVC Fittings! (But read carefully.) The links below are for short sections of common size Clear PVC and Clear Acrylic pipe of custom length, we can cut and ship rigid pipe up to 8' long. (Actually 7' 11" because it has to ship in a box.) Any pipe with an NSF rating will by law have printing on the pipe. Only the glossy white furniture grade pipe does not have printing on it. If you need something not listed, just email us and we'll put it up for you. 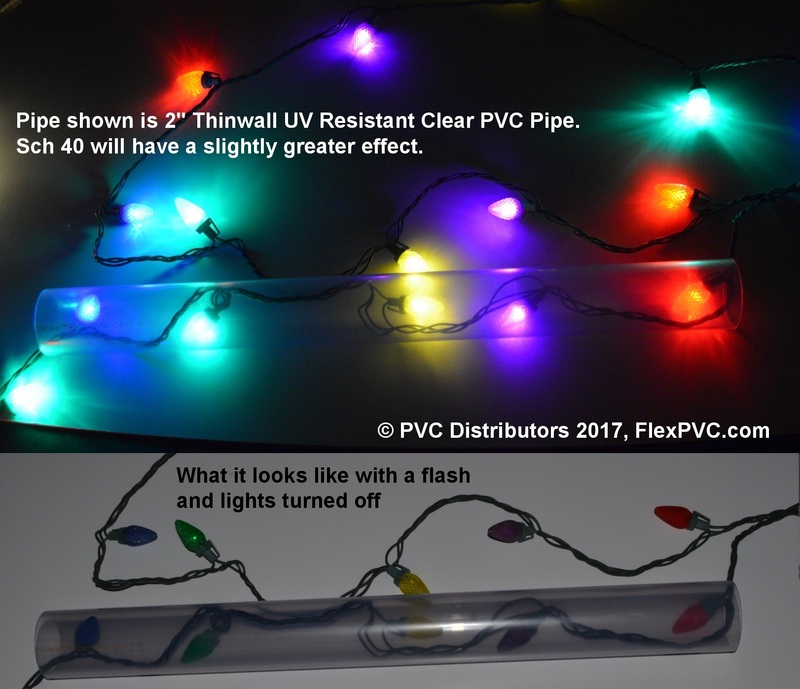 Rigid PVC Pipe Specs. NOT all of the pipe in the table below fits standard Sch 40/Sch 80 and Sch 40 DWV fittings found throughout our site. 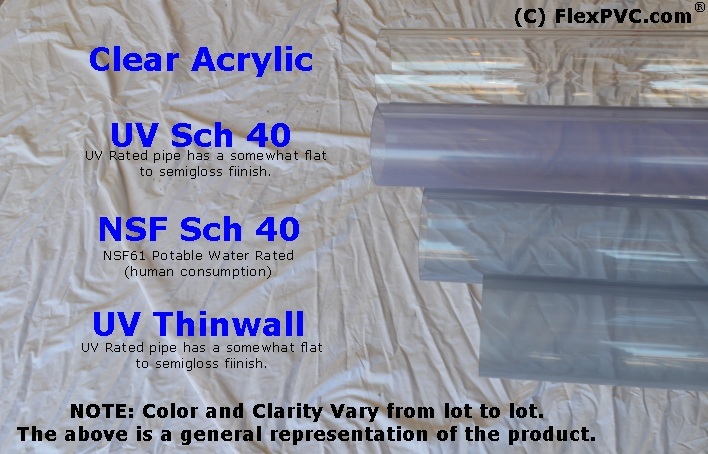 The Clear (Blue Tint) PVC pipe does but only some of the Acrylic pipe does. Read carefully the description on the products. All clear pvc pipe has a blue tint to it. Click here to see the effect. (Slip Socket, solvent weld) Fittings Available in Sch 40 and Thinwall, UV and non-UV versions. All glue into standard PVC Sch 40 and 80 fittings using PVC glue/cement and primer PVC CLEAR PIPE NSF Sch40 (1/4", 3/8", 1/2", 3/4", 1", 1.25", 1.5", 2", 2.5", 3", 4", 5", 6", 8", 10" and 12") Fits standard Sch 40 PVC Fittings. Select for potable (drinking) water and food applications. 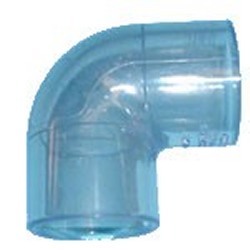 PVC CLEAR PIPE UV Sch40 (1/2", 3/4", 1", 1.25", 1.5", 2", 2.5", 3", 4", 5" and 6") Fits standard Sch 40 PVC Fittings. Select for outdoor or UV light exposure. All clear pipe has a blue tint with gold lettering. CLEAR PVC Pipe in 1/4", 3/8", 1/2", 3/4" 1", 1.25", 1.5", 2", 3", 4", 6", 8", 10" & 12" inner diameter available. In lengths of 3" up to 7' 11" available as custom cut lengths. 10' pieces are available, please email us. Price per foot will be less in 10' sections, but the price for shipping will be greater because it has to ship LTL truck. If you are going to cut it into short pieces anyway, it's generally cheaper to buy it pre-cut and save on shipping. You must use special glue for Acrylic tube. The best we have found is SciGrip #16. 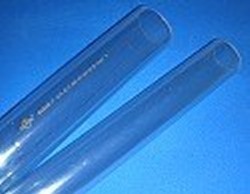 Available in 3" and 4" Clear Acrylic tube that will mate with Sch 40/80 Pipe fittings. We also have 1.5" and 2" Clear Acrylic on this page as well as 1.875" (1-7/8") OD Acrylic that will loosely fit 1.5" Sch 40 Sockets. Other sizes available, but they generally do not mate with any known plumbing or furniture grade fittings. Shipping pipe, especially longer than 4', can be expensive. It'll save you money if you can buy shorter pieces instead of one long one. See UPS Weight and Size, UPS Dimensional Weight Surcharges, Large Package Surcharge and especially UPS Surcharges and Accessories page. (Note: UPS is very tricky on this page, they do not show the actual charges, but the increases. To find the actual charges you have to download their full Retail Rate and Service Guides (PDF). It starts on page 56. Email us if you have questions. If you are looking for lifts of pvc pipe (generally thousands of feet at a time, see PVCPipe.com. Thank you!